The name Roger Rosenblatt is synonymous with the personal essay. Millions are familiar with his brief but provocative peregrinations into the human mind and spirit for “The NewsHour” on PBS and Time magazine. 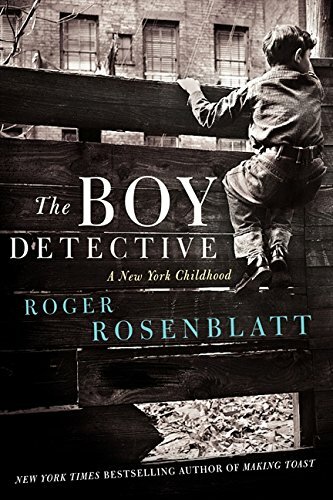 In The Boy Detective Mr. Rosenblatt continues the genre–melding of literary essay, memoir, and imagination that he began in Making Toast and Kayak Morning. It is a high pleasure to see his experiment both succeed and mature. We encounter nine-year-old Roger as a flâneur in 1950s New York, a childhood version of the boulevardier. At any age New York City has been an inspiring and imaginative place for “walkers in the city,” to borrow from Alfred Kazin’s classic title. How can its jumble, its grandeur, its contrasts not stir memory and imagination—especially in a writer? Mr. Rosenblatt doesn’t encounter fellow people on his saunters, however, so the city itself becomes a character and the flânerie of strolling weaves a rich web of associations and nostalgia. Ironically he says, “The city does not exist without people walking in it,” and he gives the example of the eerie deserted streets depicted in nuclear holocaust movies. He does populate the city streets—but from his imagination. Beautiful sentences spill out such as, “Everyone dwells in one past or another, and to a greater or lesser extent, is ruled by it.” A hallmark of memoir is the self now reflecting on the self then. This book pulls off the high wire feat of illuminating that double identity and giving readers the mental atmospheres of both narrators, the rascal back then and the reflective adult today. Bored by school and the quiet safety of his home in Gramercy Park, the boy Roger escapes to roam the city where “the boy detective” projects conspiracies, assigns events more meaning than they factually have, and imagines himself a film–noir detective in pursuit of criminals. On a wintry night six decades later the adult Rosenblatt leaves a writing workshop he has just taught at Stony Brook and meanders through the same neighborhoods he grew up in (disclosure: I know Mr. Rosenblatt from the Stony Brook-Southampton Writers Conference). Showing us different streets in different ways, he loops in time between physical localities then and now. A side effect is a literary history of great American writers who once lived in New York. In his integration of place and time Mr. Rosenblatt riffs on dozens of names. As he walks and wonders Mr. Rosenblatt examines his own life. It is the process of querying memory that creates the life patterns one sees and the threads of connections one feels. One walk leads to another. Who knows where your feet will take you? Like the essay itself, wandering feet reflect the wandering of the mind. One night as a bedtime story for his grandfather, Mr. Rosenblatt invented a day of adventure. Of the effect it had: “I saw the power of words. And I loved what I saw.” Throughout there are dollops of metafiction which tease the reader or address him in hilarious asides, creating a conspiratorial feeling of being in the know. Tone and sensory images infuse scenes like the liquor in a Baba rhum. With each turn of the page the book becomes increasingly meditative. We learn that Wordsworth was a flâneur of the countryside, Frank O’Hara a flâneur of the city. Whitman was that elegant type of stroller, a boulevadier. Melville we hear was bitter and forced to work as a shipping clerk because no one acknowledged his writing. We hear from the likes of Edgar Allen Poe, E. E. Cummings, and Emerson, the latter who opined that “the purpose of life seems to be to acquaint a man with himself.” He, like Montaigne, believed in tracking random thoughts, engaging them as if it were a flânerie of the soul. It is Roger Rosenblatt’s stretch toward such an impossible goal that the reader finds deliciously satisfying.